Stephen Florczyk, Ph.D., holding a tube of different biomaterial scaffolds. 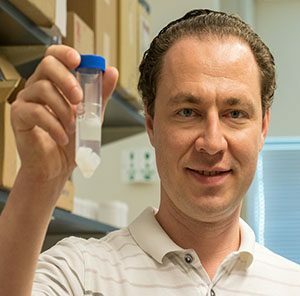 Although UCF Assistant Professor Stephen Florczyk, Ph.D., wouldn’t recommend the route that he took toward biomedical work, he’s happy with the outcome. “When I was in high school, I either wanted to go into engineering or pre-med and be a doctor,” said Florczyk. After attending a career fair at a community college outside Buffalo, NY, he wanted to be a ceramic engineer. So he attended Alfred University in upstate New York, where he majored in Ceramic Engineering and even had a college co-op at Kohler Co. in Wisconsin. “There I was making glaze for sinks and toilets. I realized, this is a great job, but if I do this for 20 or 30 years, I’m going to go crazy.” Florczyk eventually found a way to combine his interests in engineering and medicine: bioceramics. After returning from his co-op, he began researching bioceramics as an undergraduate student. He continued his bioceramics research during his master’s degree in Biomedical Materials Engineering Science at Alfred University. Following his master’s degree, he pursued a Ph.D. in Materials Science and Engineering at Univeristy of Washington, in Seattle. “I got into all of the polymer work and also did some tissue engineering studies, and then the cancer work.” Florczyk completed his post-doctoral work at the National Institute of Standards and Technology (NIST) where he researched the influence of cell-material interactions of mesenchymal stem cells with biomaterial scaffolds. Now the director of the UCF Biomaterials for Tissue Engineering and Cancer Research Laboratory, Florczyk works in three main areas to improve human health: cancer tumor microenvironment applications, cell-material interactions and tissue engineering. In a recent interview with the UCF Office of Technology Transfer, Florczyk discussed his three most recent inventions. Oncology specialists know that “one-size-fits-all” treatments don’t exist when it comes to fighting cancer. A proven cancer drug may work for one patient but not foranother, even though they have the same “type” of cancer. Still others may respond differently, with or without adverse reactions or side effects. That’s why Florczyk and collaborators at the UCF Burnett School of Biomedical Sciences and Mayo Clinic are developing a diagnostic tool that can help clinicians screen cancer therapies before administering them to a patient. “If you’re a cancer patient, basically you’re the guinea pig for your own cancer, because even though your cancer probably fits into a cancer type, it’s going to be unique in your own body,” Florczyk said. “Since cancer is a micro-evolutionary process, there’s a lot of variation in cancers of the same type from patient to patient.” This in mind, he and his research team are developing a diagnostic tool, so that patients can receive more personalized care. The tool comprises specially designed 3D biomaterial scaffolds that mimic a patient’s tumor microenvironment. By seeding the scaffolds with a patient’s own primary tumor and native tissue cells, clinicians can study the cancer cells outside of the body. More importantly, the cell culture provides a platform for testing the patient’s response to possible cancer therapies and identifying the therapies that are most likely to be effective. Thus, the tool speeds the process of treating individual patients and helps protect them from ineffective and unnecessary drugs. Because the human body contains many different tissue properties, one scaffold does not work for every tissue type, said Florczyk. Thus, the invention includes different scaffold versions, created by scaling the concentrations of the biomaterials (natural polymers) used to make the scaffolds. “So many of these cancers, especially breast cancer and prostate cancer, metastasize to bone, so we have a much stiffer scaffold that can be used to simulate that,” said Florczyk. Varying the scaffold properties enables the ability to model the stiffness of the healthy, native tissue, the primary tumor, and bone metastatic sites, which may enable scientists to predict the metastatic nature of a patient’s cancer. Most cancer patients die from metastatic cancer, which has limited treatment options. While developing the diagnostic tool, Florczyk also developed techniques for creating biomaterial scaffolds that could support cancer cell growth outside the body. “We’ve combined freeze-casting—which is a more traditional technique—with 3D printing,” Florczyk said. “By simply changing our solution concentration or the freezing temperature, we can manipulate both the stiffness and the strength, and also change the pore size,” Florczyk said about the freeze-casting. He added that within each composition or freezing temperature, the scaffolds are relatively consistent from batch to batch. A plus for large-scale production. Though freeze-casting generates reliable, usable scaffolds, Florczyk said that the process limits the ability to design the scaffolds for different applications. He also noted that 3D printing alone typically produces scaffolds with very smooth features. Since cells can respond to the environment around them, the scaffold surface texture can affect a cell’s morphology. “This can cause changes in the cell signaling, gene expression and a lot of different phenotypic markers,” he explained. Therefore, by combining the processes, the new technique produces scaffolds with the stiffness and porosity that cells need to behave as they would in the human body. For more details about the invention, click here. Besides the innovations with biomaterial scaffolds, Florczyk, in collaboration with Dr. Yongho Sohn from UCF Materials Science & Engineering, is also evaluating material compositions for use in medical implants. Compared to stainless steel or titanium, the alloy compositions provide higher strength, greater corrosion resistance and additional flexibility. The alloy composition is a form of multi-principal element alloys (MPEAs). Typical metal alloys consist of a main base metal or one other primary component. However, an MPEA has four to five elemental components that are in equal ratios. To learn more about Florczyk’s work and additional potential licensing or sponsored research opportunities, contact Brion Berman at 407.882.0342.